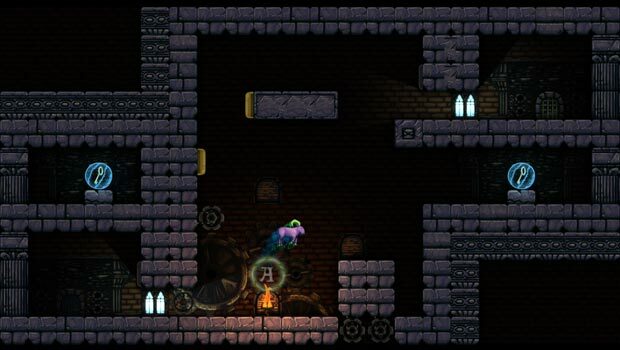 While we mentioned Escape Goat 2 was in development for PC earlier this year, GDC has provided us with our first hands-on as well as some exclusive screenshots and details about the upcoming title. For the uninitiated, Escape Goat is a fun indie puzzle title by MagicalTimeBean, the studio of one-man team Ian Stocker who handled programming, art, and music for the original game, although he's joined by others this time around. Playing through several levels, I have to say that the new visual style provided by Randy O'Connor is great, and I love the new puzzle gimmicks including a dark stage with moving lights that provided a very frantic puzzle-solving experience. Other details include a release date of Spring 2013, over 100 new puzzles, and launch on PC first followed by other platforms to be announced. Check out some additional screen shots below and let us know if you're a fan of this lovable purple goat. Are you as happy as I am to see it getting a sequel?